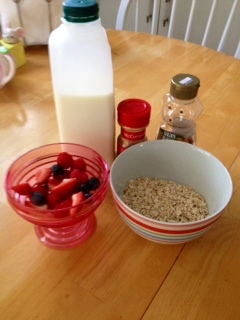 Cooking With Catherine-Organic Porridge - What Would Kate Do? Kate has always been known for leading a healthy lifestyle, and now that she has a new baby I am sure she is keen to continue that. One of her favorite ways to start the day is with a bowl of organic porridge. This warm, hearty meal is perfect on a chilly Fall morning or for when you don’t have much time because George is crying in the other room. This “recipe” couldn’t be any simpler and you can add toppings such as fresh fruit, cinnamon, nuts or whatever you fancy. 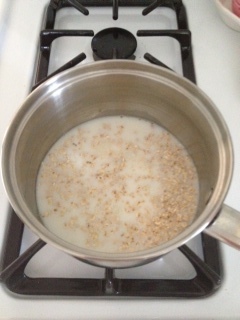 In a saucepan slowly bring the oats and water/milk to a boil then simmer for 3 to 4 minutes stirring all the time. 2. Top with fresh fruit, honey, and cinnamon. Serve immediately. 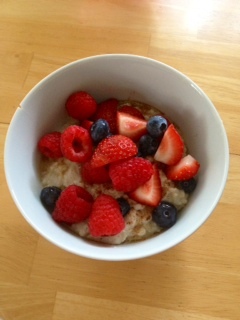 I topped mine with a mix of strawberries, raspberries, and blueberries, along with honey and cinnamon. 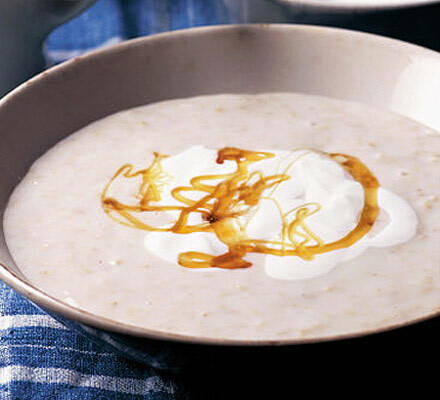 The recipe calls for either water or milk, but I always use milk because I find it gives the porridge a much more creamy texture. It is both filling and takes less than 10 minutes to make, so go on and start your day the Kate way!